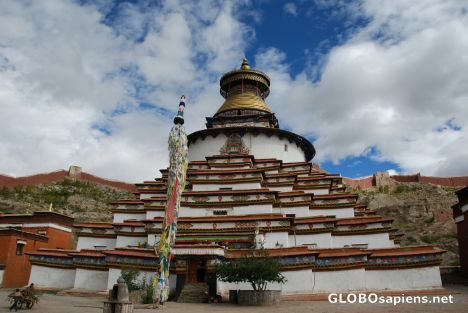 The Kumbum means the Stupa of 100 000 deities. I t was built in 1427-39. Rising 37 metres high including the golden dome. The stupa has 108 gates, nine storeys and 75 chapels. Octagonal in shape, it is a unique structure in the Buddhism world. The Kumbum is a three dimensional mandala meant to portray the Buddhist cosmos. The Kumbum, like other mandalas, which are portrayed by a circle within a square, enables the devotee to take part in the Buddhist perception of the universe and can depict one’s potential as they move through it. Mandalas are meant to aid devotees on the path to enlightenment.